Nature is the ultimate puzzle player, as scientists at the European Center for Nuclear Research (CERN) found out in July. In the late 1950s, particle physics was in crisis. Being the branch of physics that studies the structure of matter, particle physicists search for the smallest bits of stuff that make up everything that exists — the elementary particles. To get the designation of "elementary," a particle can't be made of smaller bits: an elementary particle is a fundamental brick of matter, a concept that goes back to the Greek philosophers Leucippus and Democritus, who, around 400 BCE, proposed that matter was made of indivisible chunks called atoms (from the Greek "a-tomos" — that which can't be cut). The problem physicists faced at that time was that as energies in experiments with colliding particles grew, so did the number of "elementary" particles. 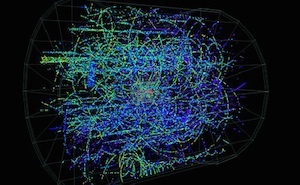 Called hadrons, their numbers mounted to hundreds. Hardly "elementary" by any measure. The spectacular solution came in 1964, when Caltech physicist Murray Gell-Mann and, independently, George Zweig, postulated the existence of new elementary particles that made up the hundreds of hadrons. The idea was deceptively simple: The same way that all the natural and artificial elements of the periodic table are made of only three particles (protons, neutrons and electrons) in different numbers, the hadrons are made of "quarks" in different combinations. The name came from James Joyce's novel Finnegans Wake, Book 2, Episode 4: "Thee quarks for Muster Mark!" The cool and bizarre thing about quarks is that they have fractional electric charge. Remember how a proton has one unit of positive electric charge and the electron has one unit of negative electric charge? Well, if a proton is made of three quarks, how does that work? Take the up quark to have charge +2/3 of the unit of charge and the down quark to have charge -1/3. So, a proton, being (uud), will have total electric charge +2/3 + 2/3 -1/3 = +1. Voilà! A neutron, being (udd) has zero electric charge. The electric charge of a hadron helps dictate what quarks can make it. As with electric charge, you can assign other "quantum numbers" to the quarks: The same way we have different kinds of IDs (Social Security number, passport number, driver's license, etc. ), quarks have different numbers, besides the electric charge. To assemble them into hadrons, physicists need to account for all these numbers, using them as a building principle. As Mendeleev did for chemical elements and the periodic table, predicting the existence of new elements that "should be there" to complete the periodic regularity he had found, Gell-Mann explored the symmetries of the quantum numbers in hadrons to successfully predict the existence of new ones. In a nod to Buddhism, he called his particle-predicting puzzle the "Eightfold Way." It was as if nature made the properties of particles into a puzzle: For the symmetries to be satisfied — for the puzzle to be completed — all pieces had to be there. If one was missing, experiments should find it. And they did, quite beautifully. Last week, scientists working at the Large Hadron Collider (LHC) at CERN, where the Higgs boson was discovered in 2012, announced the discovery of yet another piece in the puzzle predicted by Gell-Mann and refined by D. Strottman in 1979, even if extremely exotic in its properties: Instead of being made like the other hadrons, with 3 quarks or a quark anti-quark pair, this particle is a "pentaquark," made of four quarks and one anti-quark. (For the technical expert, here is the reference. For the non-technical reader, here is a press release. The discovery is significant because it clears up 50 years of false signals and potential sightings of the particles. It shows how science progresses, as experiments test a hypothesis consistently until there is consensus in the scientific community. The new results, although still awaiting peer review, seem to be strong and clear enough to confirm the existence of such particles. Once again, quarks show that nature not only likes puzzles, but that it likes its puzzles to be completed.